With the bounty of seasonal produce available over the the summer months, there’s no better time to sink your teeth into a thick wedge of pie. Tender flaky crust, sweet oozy filling, perhaps topped off with a scoop of local ice cream…yeah, you get the picture. Delicious! Keeping that in mind, we’ve rounded up our list of some of the best farm stand and market pies this province has to offer. Whether you enjoy traditional flavours or something off the beaten path, there is truly a pie for everyone. When you know where to go, finding the best slice around is as easy as, well, pie. Hands down, it’s the market’s best-selling pie year round – and we can see why! With a mixture of raspberries, blueberries, strawberries, blackberries and apples with a crumble topping, every bite is completely different. But you can be sure you’re putting a whole lot of Bruce County goodness on your fork! Named after the historic battle of 1812, this pie is sure to please! Packed with blueberries, sour cherries, raspberries, cranberries and strawberries, it’s an explosion of summer time flavour from Chatham-Kent. Stop by this Simcoe County landmark on the weekends for a taste of one their most popular desserts. They also make seasonal favourites like strawberry rhubarb and peach! Come by around Christmastime for their legendary mincemeat or gingerbread cream pie for something really indulgent. We discovered the pie at Farmhouse Pottery almost by accident. What was once happenstance has become a summer pilgrimage — the perpetual, pan-ultimate pie pilgrimage if you will! On your next country drive or after your next hike on the Bruce Trail, drop into this rustic Gallery & Cafe. Possibly Mono’s best kept secret — the pies served in this charming shop slash cafe are made by the towns mayor, Laura Ryan… and are impeccable. They’re perfect, in every way. The Hughes family have been farming at Springridge in Milton for over 50 years. And over the decades, they’ve made a lot of pies and have come to one conclusion: the perfect pie requires the perfect fruit. Come by each season for new varieties to tantalize your taste buds. You can’t go wrong with blueberries. And who doesn’t love a good Ontario peach? But when you put these two stunners under the same buttery crust, it’s a match made in pie heaven! Be sure to swing by Guelph for this late summer favourite. These tart, ruby gems make a tasty summer pie that’s a little different from traditional pie fillings! 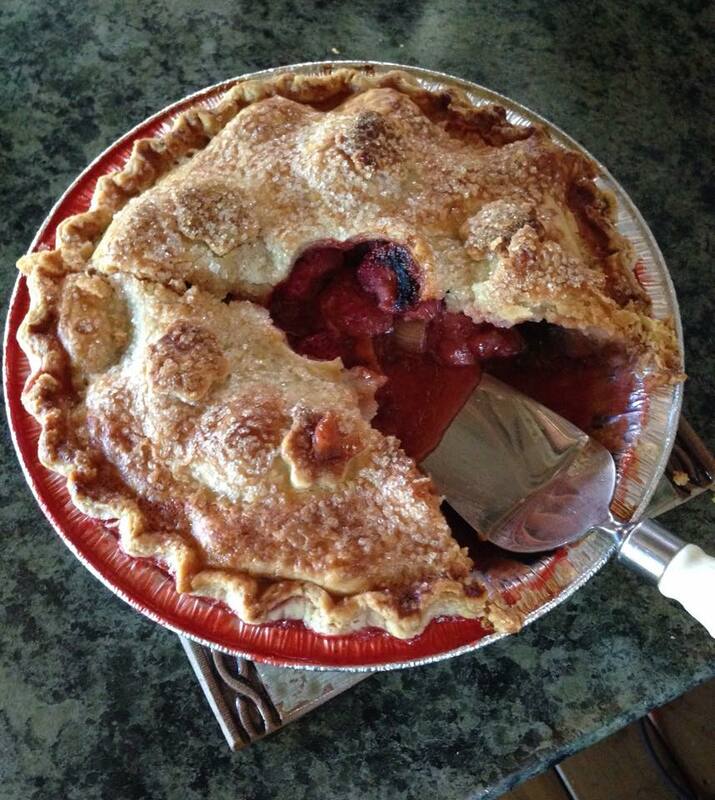 Stop by Hy-Hope Farm in Ashburn for no less than eight varieties of pie at any given time. We hear that their Nan’s butter tarts are also worth the drive (but don’t even try asking for this top-secret recipe)! There you have it – our picks for the best farm stand pies! Why not spend the summer trying each and every one? The only give away will be your sticky fingers. Dig in!